Move over s’mores! Chocolate and marshmallows combine with a touch of coffee and toasted nuts, to make a candy even adults want to devour. Alright, so as much as I waxed poetic about homemade marshmallows yesterday, that one 8×8 recipe yielded far more marshmallows that I’m interested in eating. And if I let the kids have as much as they’d like, that’s what they would have for breakfast, lunch AND dinner. Not happening. kids. So I had to find a way to make the marshmallows interesting to the adults, too. Fluffernutter? Too messy, and can’t be given away very easily. Rice Krispy treats? Maybe, but I want more adventure! S’mores are always good, but the last time we made those, it was a bit of a disaster with the 3 year old. I came very close to making a toasted marshmallow milkshake, but that wouldn’t really do much to reduce the sheer volume of marshmallows that invaded our home. Then I stumbled upon a Choco-mallow recipe on the King Arthur Flour website, and knew I had a winner. Bonus: it uses ingredients I already had on hand. 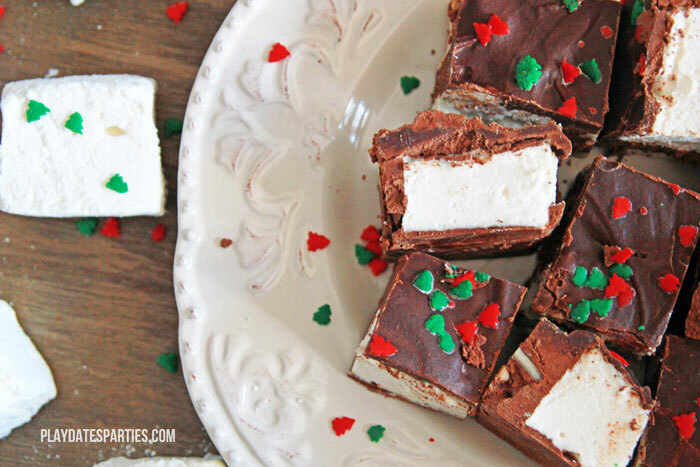 What makes these treats so awesome isn’t the just marshmallows…it’s the coffee. All it took was a little touch of instant coffee powder, and you get a delicious accompaniment to the sweetness of the marshmallows and chocolate. 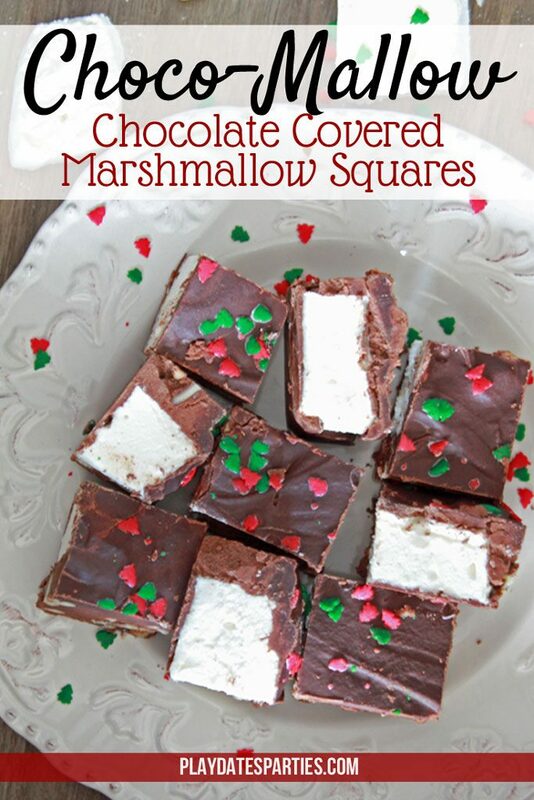 Just one or two choco-mallow candy squares is enough to satisfy any sweet tooth. And talk about a hit…the Husband was actually upset when he saw me giving these away (much of the candy we’ve made was passed along to family). Not to worry, I’d saved a small plate just for him. Move over s'mores! Chocolate and marshmallows combine with a touch of coffee and toasted nuts, to make a candy even adults want to devour. Prepare a 9x9" square pan with two layers of parchment paper, making sure that all four sides of the pan are protected with parchment. Tip: use a bit of cooking spray between the layers of parchment paper and crease the paper at the edges to keep the paper from slipping. In a 2 quart saucepan, combine the chocolate, cream, instant coffee and vanilla. Heat over low to medium-low heat until everything is combined and smooth, stirring often to prevent scorching the chocolate. Spread a small amount of chocolate to create a thin layer on the bottom of the pan. 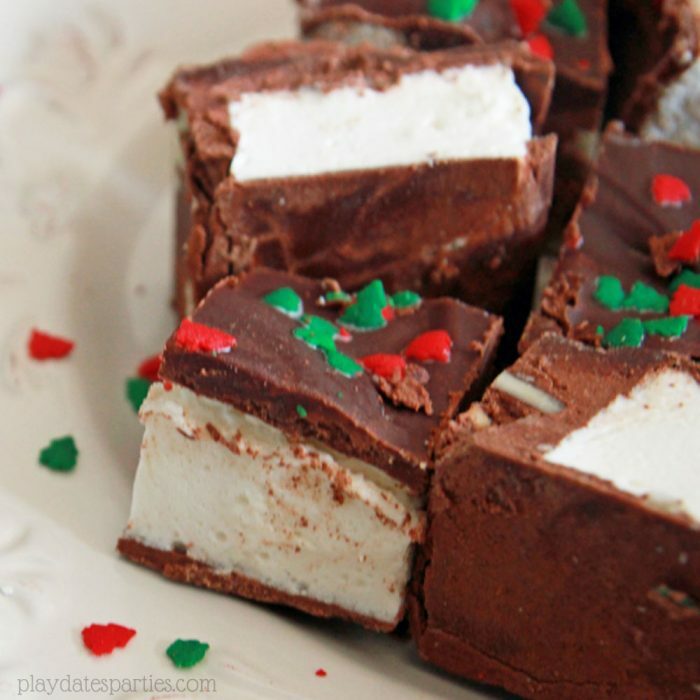 Place marshmallows on top of the chocolate. If using large marshmallows, you may want to cut them in half on the long side so they aren't too tall in the pan. You can also try using mini marshmallows. Sprinkle the chopped pecans between and on top of the marshmallows. Spread the remaining chocolate over top of the marshmallows and nuts, ensuring that everything is covered. Sprinkle holiday sprinkles on top. Refrigerate to set, at least one hour. 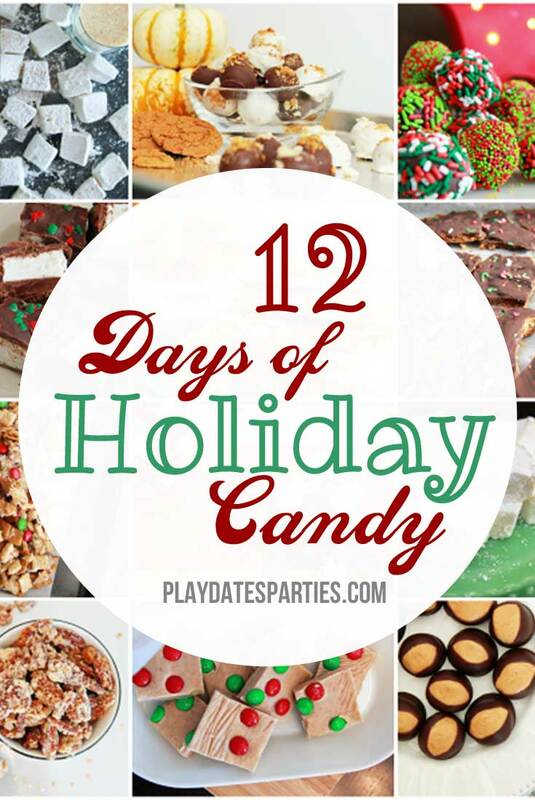 Using a sharp knife, carefully cut the candy into squares. 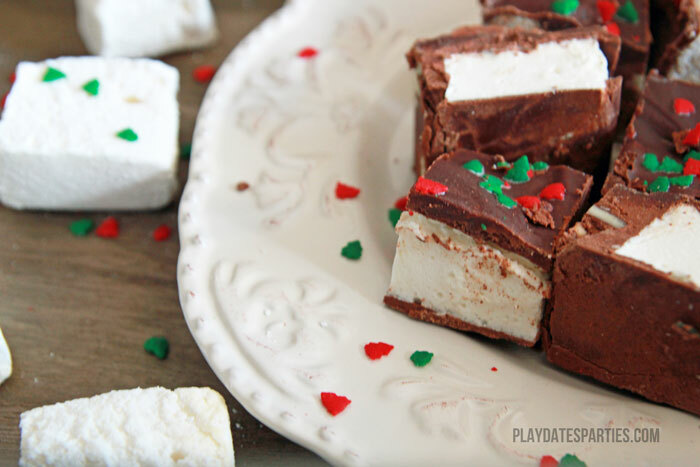 How would you use leftover marshmallows?